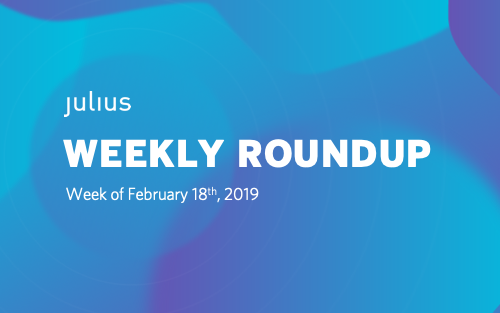 Trends, news, and analysis: catch up on the week's biggest headlines with the Julius Works Blog's weekly roundup, your cheat sheet for staying in the know with influencer marketing. Last weekend, our Director of Business Development, Anton Capria, attended VidCon London (read his preview blog here). He followed the Industry Track of events, gaining valuable insight into the platforms and creators who respectively host and post the content that powers influencer marketing. Among the exciting announcements and takeaways from the convention were several high profile changes coming to Instagram this year. Instagram announced that it would partner with Facebook’s creator studio, bringing Facebook’s content library and analytics onto Instagram’s platform. Instagram was already testing “creator accounts” in preparation for the move, and the enhanced capabilities are noteworthy for influencers on the platform. Facebook, on the other hand, is doing its best to catch up to YouTube by pushing Facebook Watch to creators. Last week, Digiday reported that Facebook was planning to fund influencer productions through Facebook Watch. This announcement came on the heels of a massive push at VidCon, meant to coax influencers onto the platform. Instagram has undergone a slew of changes in the past few months, giving creators more tools to do what they do best, and more insights to evaluate what works. Facebook, meanwhile, is heavily marketing Facebook Watch as an answer to YouTube’s pre-eminence in the long-form video space. Projects like MTV’s “Real World” reboot and a cooking show with NBA All-Star Steph Curry will headline these efforts, as Facebook tries to coax more creators onto its platform. As the influencer marketing industry continues to grow, the platforms that host this highly valuable content are looking to get a piece of the pie. Though Facebook nominally owns Instagram, they are still very much separate business entities. It comes as no surprise that Facebook is trying to catch up with its chief competitors. The same can be said of their expansion into the trend of short-form lip-syncing videos. Lip Sync Live, though a long way from being a genuine competitor to TikTok, is still an impressive feat. Facebook offers creators excellent tools and analytics for content production and distribution – they simply lack the same appeal their competitors have. Perhaps 2019 is the year that changes. Last week, LinkedIn announced it will beta-test a new live video feature. The beta will be invite-only, but it likely won’t be long before the feature is available for all LinkedIn users. Since launching native video in 2017, LinkedIn has found video to be a tremendously popular format for its professionally oriented audience. Videos garnered over 300 million impressions in 2017 alone, and were five times more likely to create a conversation on LinkedIn. Reiterating the social pivot to video, Shopify released an eCommerce report last month that highlighted the importance of storytelling in ecommerce and digital advertising at large. Video content is a massive component to digital storytelling, whether live, short-form, or long-form. Shopify points to the desire of consumers to identify with stories that resonate on deeper levels than just purchasing utility. Many consumers want to feel like a brand reflects their values and beliefs. Whether it’s a pop-up display, a live video, or an influencer post, consumers want branded content to tell stories that matter. Storytelling is one of the primary benefits of influencer marketing, as influencers have the capacity to tell authentic stories with a brand through a variety of media. Whether it’s a vlogger integrating a brand into their daily routines, a photographer documenting an experience, or a content creator using a brand to make something unique, influencers can tell stories like no others. That platforms like LinkedIn are embracing the power of video, especially live video, is a lesson learned from the market-changing effects of influencers. Social media users demand authenticity, and live video is perceived as more authentic than most other forms of content. There’s only so much planning and scripting that can go into a live video. A branded live video is a calculated risk with the potential for generous returns, because it’s an opportunity to interact with customers and prospects in a genuine way. It’s like speaking with a customer representative, but without the expectation of an immediate purchase. LinkedIn’s embrace of live video opens many doors for B2B marketers, especially those looking to incorporate influencers into their marketing strategy. That's all for this week, thanks for reading. Be sure to follow us on Twitter, Facebook, Instagram, and LinkedIn for more influencer marketing news, analysis, and interesting content.